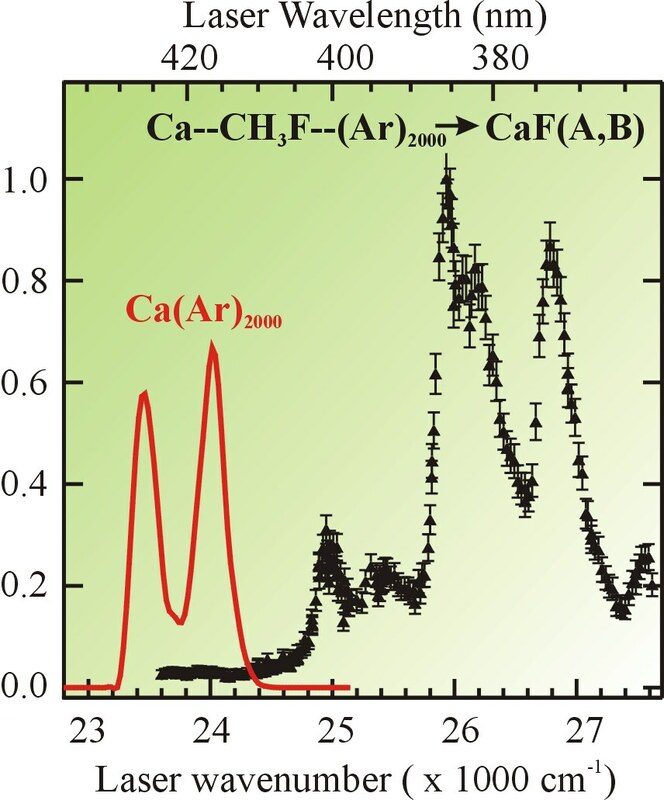 The “cluster isolated chemical reactions” technique is used to examine the dynamics of the photoinduced reaction producing electronically excited CaF when 1:1 Ca···CH3F complexes are deposited at the surface of large argon clusters. This technique ensures quantitatively that 1:1 complexes are actually at the origin of the observed signals. The reaction is monitored by observing the CaF chemiluminescence while scanning the photoexcitation laser. The resulting action spectrum contains information about the absorption bands of the complex, filtered by the dynamics of the reaction. The observations suggest a profound alteration of the calcium electronic structure and a control of the reaction by the CF stretch in CH3F. Action spectrum for the formation of the excited CaF product (experimental points). It is considerably blue shifted compared to the other curve that shows the excitation spectrum of the Ca(4s4p 1P)Ar2000 fluorescence when no CH3F molecule is present on the argon cluster. The deep structures in the action spectrum are partly assigned to excitation of the C-F stretch.